Valentine’s Day is a synonym of chocolate, but that doesn’t mean we have to give up our healthy eating habits. 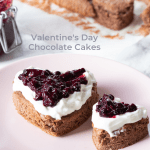 These flourless chocolate cakes are the Valentine’s Day recipe you are looking for. 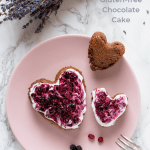 They are gluten-free, sweetened only with a little honey, they are easy to make and they easily be added to your Meal Plan. As you can see in the video, this recipe is easy to prepare since it has only a few ingredients, adding them one by one into a bowl and then baking it. You will only need a separate bowl to beat the egg whites until stiff, so that the cake has a fluffier consistency. 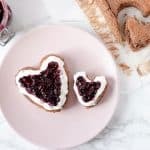 This recipe can be prepared any time of the year and, if you like to celebrate Valentine’s Day with a chocolate cake, you can use this and just present it in a heart shape. 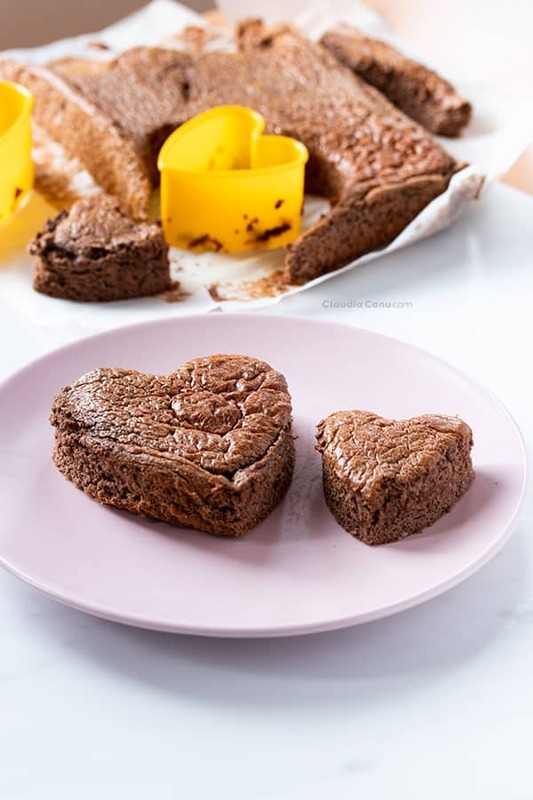 I personally don’t have a heart-shaped oven mold, so I baked the cake in a regular rectangular mold and then I used a cookie cutter to cut it into a heart shape. If you are going to use the same trick, keep in mind that, since the cake has a banana in it and we are using the egg whites beaten stiff, the cake is very humid and fluffy, so you’ll need to be careful when cutting it. However, if you have a heart-shaped baking dish, you can just use that one. Keep in mind that, depending on the size of the mold you use, the flourless chocolate cake will be more or less thick. So that you have a reference, the dish I used in this recipe had a size of 10.5×7 inches. Why do I consider these flourless chocolate cakes to be healthy? 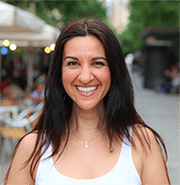 In my recipe post for the Mirza Ghasemi, I had talked extensively about all of the properties of the egg and I have also added links to a few studies with interesting results. So, I’d like to invite you to read it if you have any doubt about whether it is beneficial or not, to consume eggs. Hence, the name of this recipe is “Flourless Chocolate Cakes”. In fact, the only flour contained in these cakes is almond flour, which makes this deliciousness also gluten-free. The only sweetener used in these chocolate cakes is a teaspoon of honey, which is equal to a very small amount for each individual serving. 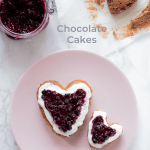 I used a healthy homemade elderberry jam to decorate these cakes, which adds sweetness and taste but in a healthy way. Even so, these flourless chocolate cakes alone have a sweet flavor, thanks to the banana, the cinnamon and the carob. How long do these flourless chocolate cakes last? Once it’s baked, it can be stored for about four or five days. However, once you add the decoration with yogurt and jam, I recommend that you consume them the same day or the next day, at the latest. 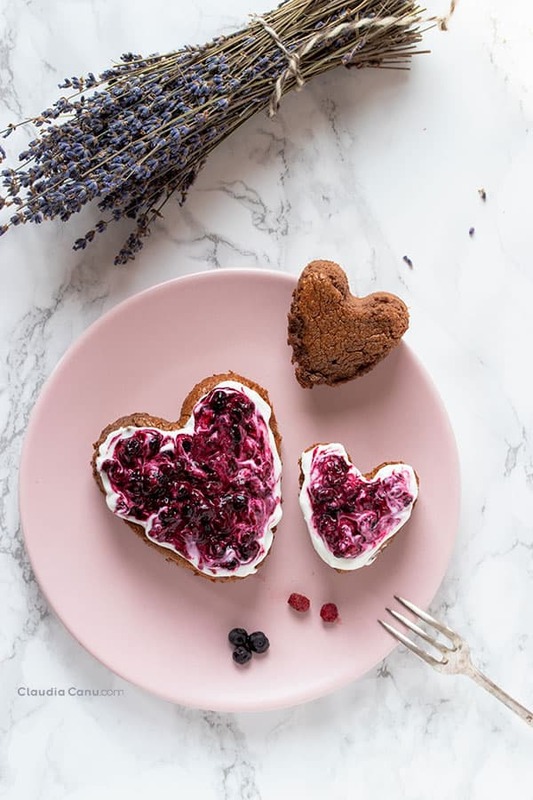 So, if you already know, that on Valentine’s Day, you will not have much time available, you can bake them the day before and then decorate them the day after. The same is true if you want to take them somewhere. The best thing is that you transport them in a container and then decorate them once you reach your destination. Is it possible to prepare a vegan version of these flourless chocolate cakes? If the honey can be easily changed by your favorite sweetener, eggs are definitely one of the main ingredients in this recipe. Maybe you could try using vegan eggs instead of normal ones. Personally, I haven’t tried it, but it is certain that, by not having the egg whites beaten stiff, I imagine that it will not be as fluffy. Can you prepare them with other ingredients to get different flavors? 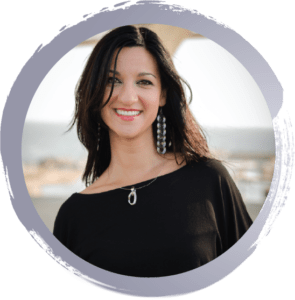 Like in other recipes that you can find in this blog… for example, the muffins or the hazelnut cream, carob can be substituted with cocoa powder in equal amounts. Another option is that you make a white version without chocolate or carob. 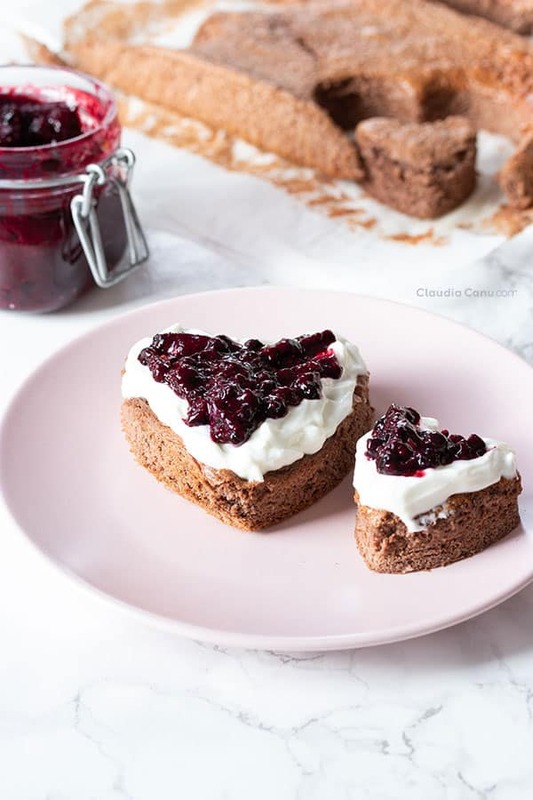 In that case, we would just call them flourless cakes 😀 You can do this by substituting the two tablespoons of those ingredients with two tablespoons of almond flour. You could also use more cinnamon, and even vanilla, to give it more flavor. As always, I appreciate your stopping by my blog. If you think this post might help someone you know to make another step to a healthier lifestyle, please don’t hesitate and share it away! Use two bowls to separate the 6 egg whites from the yolks. In a food processor, add the banana, 1 tbsp of cocoa, 1 tbsp carob, 1/2 tsp of cinnamon, 1 tsp of honey, 6 egg yolks and the 1/2 cup almond flour. Process all of the ingredients for a few minutes until the dough has no lumps. Add a pinch of salt to the egg whites and beat them until stiff. Add the egg whites to the dough in small quantities and mix well before adding more whites. Pour the dough into your mold and move it so that it looks flat. Once removed from the oven, wait for it to cool before decorating it. Add the amount of yogurt needed according to the size of your cake and cover the entire surface of the cake. Add the jam from the center of the cake, following the shape of the cake, but leaving a margin to see the yogurt as a frame. If you want the jam to have the marbling effect, use a toothpick to mix it carefully with the yogurt that is underneath. 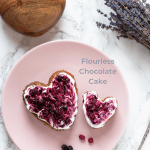 This recipe for flourless chocolate cake looks yummy as well as healthy! Perfect for Valentine’s Day! These cakes look so good! I can’t believe there is no flour either. I have many people who avoid gluten so this is a great option. It is indeed a great option for everyone who avoids gluten. Thank you, Amanda! These look so cute, and love they are so healthy too. What a fab sounding cake, it looks so light and airy. Delicious! Two perfect adjectives to describe them. Thank you, Brian!